In pure form this metal is 45% lighter than steel of comparable strength and twice as strong as aluminum with only a 60% increase in weight. For this reason titanium is highly valued in several contexts. Military, medical, aquarium, automotive, aerospace, desalinization, shipping, power generation, electronic and even jewelry industries implement titanium in manufacturing processes. Titanium is utilized in the production of such diverse items as bicycles, plastics, exhaust systems, valve springs, paint, jet engines, missiles and even spacecrafts. While some degree of titanium is present in each of these, they more commonly employ alloys. Titanium alloys are metals composed predominantly of titanium, but that also include other metals which alter its properties. The popularity of alloys over pure titanium arises from the extreme hardness of pure forms, which makes them difficult to weld and shape during production. Medical industries, however, commonly utilize pure titanium for surgical instruments, implants and prosthetics as this sterile metal does not react negatively with the human body. Some body piercings employ pure titanium for the same reason, though the cost of the material limits this use. The cost of titanium is directly related to the difficulties inherent in its extraction. Although titanium is the ninth most abundant element, making up 0.57% of the Earth’s crust, it is never found in pure form. Instead, titanium is found in ores, or mineral deposits, such as Rutile, Ilmenite and Sphene. The most common technique is the Kroll Method. This involves forming titanium tetrachloride through fractional distillation. This substance is then reduced to useable metallic titanium using magnesium. The resulting highly porous yield is referred to as a sponge. The titanium sponge may then be melted or pressed into castings which form foil, sheets, wire, granules, bars or powders that, pure or alloyed, are distributed to manufacturers. Manufacturing companies select either plating anodes, which are used in plating or electroplating processes, or sacrificial anodes, which are used to protect base structures. Hot or cold forming, flat rolling, extrusion, welding, machining, casting, wrought, forging and spinning processes can be used individually or in conjunction with other techniques to transform stock shapes into final products. 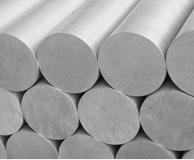 While size and production processes are important considerations, titanium grades should be regarded to ensure the proper alloy or pure metal is selected for a given task. Titanium Metal Titanium metal is an extremely strong, low density and highly corrosion resistant substance used in a wide variety of industrial applications for which these traits and others, such as heat resistance, are desirable.